The Unilux "W" series water boiler is the first and only 5 pass bent tube boiler that will operate at 85% efficiency…standard. The tangent tube design utilizing a minimum tube size of 1.5" OD, SA 178 Grade "A" material, allows for unsurpassed convective internal pumping and heat transfer. Standard design pressure is 160 PSI / ASME Section IV. Higher pressures available. With the greatest size range of standard product available in this design, Unilux has been the discerning engineer's choice for decades. Boiler controls are face mounted and wired to a junction box that is easily accessible for inspection and service. Easy to read gauges are rigid mount to the upper drum for maximum accuracy. Unilux water boilers are also available as "FE"; field erect units which require absolutely no welding on site for assembly. All Unilux boilers have simple to remove and replace access panels and tube change is done without any welding or rolling. Fireside access is easy with either a hinged burner or rear man door and simple, bolt on 11 gauge, steel, rigid access panels. Standard warranty is 25 years against thermal shock damage. Use Unilux "W" series boilers wherever heated water is required. Unilux manufacturers watertube boilers and specializes in highly efficient systems that recover quickly and leave a smaller carbon footprint. 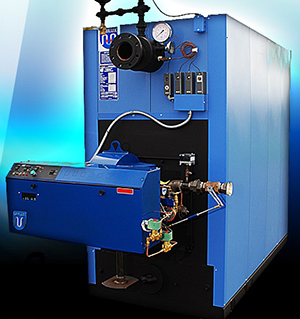 Products include steam, hot water and high temperature hot water boilers for 1 MMBTU to 38 MMBTU.